Christina Garton’s Ancient Rose Scarf. “The Earliest weaving appears to have been limited to the capacity of the simple four-harness loom. Several weaves are possible on this loom, but the one that admits of the widest variations is the so-called ‘four harness overshot weave,’—and this is the foremost of the colonial weaves.” So wrote Mary Meigs Atwater in The Shuttle-Craft Book of American Hand-Weaving when speaking of the American coverlet and the draft s most loved by those early weavers. Overshot, in my mind, is the most North American of yarn structures. Yes, I know that overshot is woven beyond the borders of North America, but American and Canadian weavers of old took this structure and ran with it. The coverlets woven by weavers north and south provided those individuals with a creative outlet. Coverlets needed to be functional and, ideally, look nice. With (usually) just four shaft s at their disposal, weavers gravitated toward overshot with its stars, roses, and other eye-catching patterns. Using draft s brought to North America from Scotland and Scandinavia, these early weavers devised nearly endless variations and draft s, giving them delightful names and ultimately making them their own. When I first began designing my overshot scarf, I used the yarn color for inspiration and searched for a draft reminiscent of poppies. I found just what I was looking for in the Ancient Rose pattern in A Handweaver’s Pattern Book. When I look at the pattern, I see poppies; when Marguerite Porter Davison and other weavers looked at it, they saw roses. I found out later that the circular patterns—what looked so much to me like flowers—are also known as chariot wheels. In A Book of Hand-Woven Coverlets, author Eliza Calvert Hall quotes the great William Shakespeare himself when writing of coverlet names: “What’s in a name? That which we call a rose by any other word would smell as sweet.” I, too, can’t help thinking of this quote as I survey my finished scarf. Would I love it as much if I saw chariot wheels instead of poppies and roses? Perhaps, but given the choice, I prefer the blossoms. EQUIPMENT: 4-shaft loom, 10″ weaving width; 10-dent reed; 2 shuttles; 2 bobbins. YARNS: 8/2 Tencel (100% lyocell, 3,360 yd/lb; Maurice Brassard et Fils; 3/2 Tencel (100% lyocell, 1,250 yd/lb; Teresa Ruch). OTHER SUPPLIES: Professional Textile Detergent or Synthrapol. 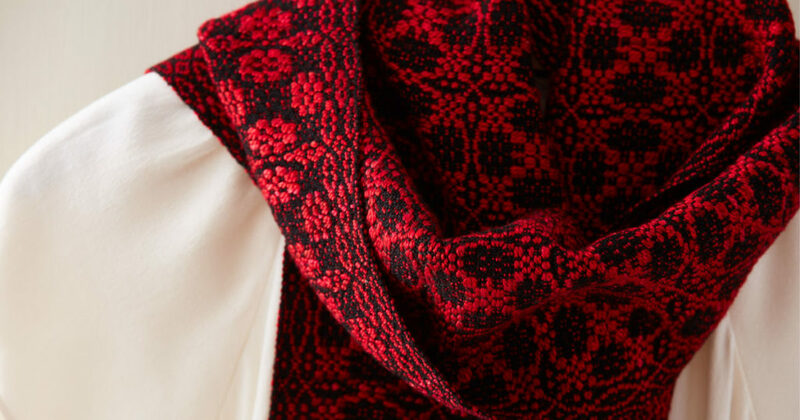 Featured Image: Closeup of Christina Garton’s Ancient Rose Scarf. 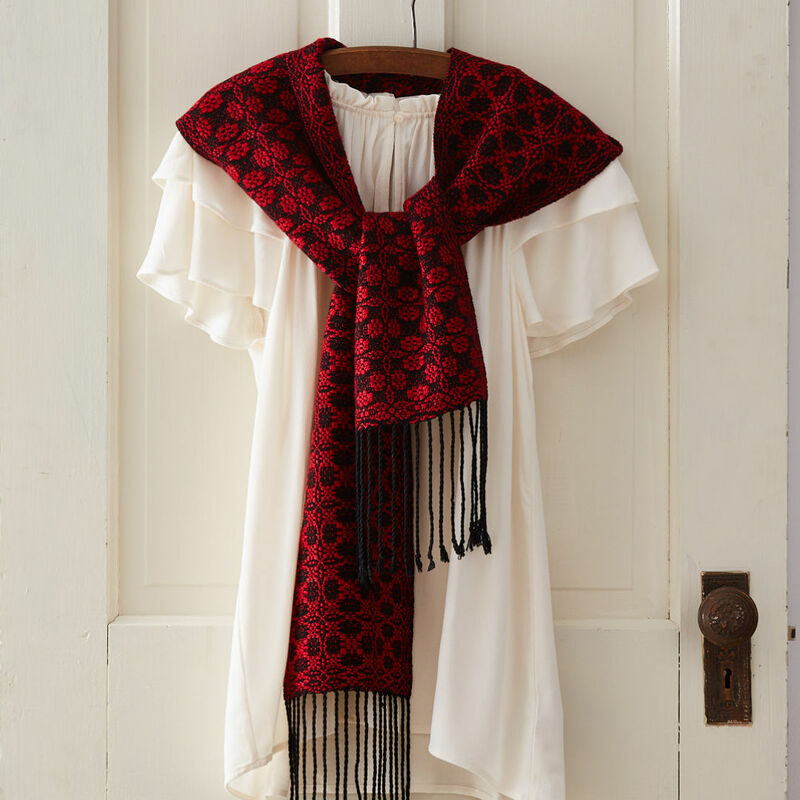 Explore more weaving patterns in Handwoven!